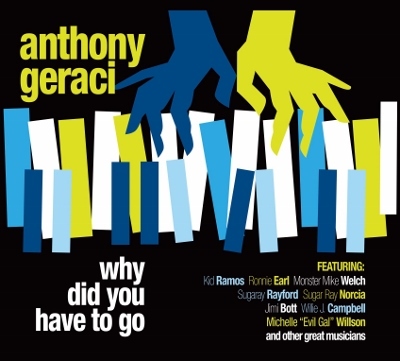 If you’re looking for something from pianist Anthony Geraci that’s drastically different from what he does with his main gig with Sugar Ray and the Bluetones, then Geraci’s latest album Why Did You Have to Go (Shining Stone Records) isn’t going to be it, at times sounding very much like the music of the band Geraci helped found and of which he’s remained a part now for 40 years. And that’s really no surprise, considering that Geraci has again, just as on his 2016 Fifty Shades of Blue album, enlisted his Bluetones bandmates for much of this project, even bringing in guitarist Ronnie Earl and drummer Neil Gouvin for a reunion of the band’s original members on two tracks. But a few things do help separate this album from that of a Bluetones recording: all 13 of the tracks here were written by Geraci, and, although prominently featured, his former and current Bluetones bandmates actually make up less than half of the guests on this project, with other appearances including singers Sugaray Rayford, Willie J. Laws and Michelle “Evil Gal” Willson, horn players “Sax” Gordon Beadle and Doug Woolverton, and drummer Marty Richards, as well as singer Brian Templeton, guitarist Kid Ramos, bass player Willie J. Campbell and drummer Jimi Bott, the four of whom Geraci recently teamed with under the name of The Proven Ones (the debut recording from whom may be a better place to look if you do want to hear Geraci doing something a little different, which would probably only be because you want to hear more of his great work, not because you don’t like what you’ve heard from him with the Bluetones!). Sugar Ray Norcia provides some soulful vocals on the swaying opening title track, with he and Geraci joined by fellow Bluetones members Monster Mike Welch on guitar and Michael Mudcat Ward on bass as well as Marty Richards on drums and some nice horns. Much of that group returns, swapping out Richards with Neil Gouvin on drums and Norcia’s harmonica for the horns along with adding Ronnie Earl on guitar, for the shuffling gem “Time’s Running Out” and the 9-minute creeping blues of “My Last Good-Bye”, two of the album’s best numbers along with the swinging straight blues of a “Fly on the Wall” that features Willie J. Laws on vocals and rhythm guitar, gritty lead guitar from Kid Ramos, and energetic piano from Geraci in addition to bass and drums, respectively, from Willie J. Campbell and Jimi Bott, and the tortured vocals of Sugaray Rayford on the “Angelina, Angelina” that immediately follows, making for a pretty terrific one-two punch. Laws returns for a stripped-down, slow blues piano-and-vocals number with just Geraci on “Baptized in the River Yazoo”, while Rayford provides vocals on two additional tracks in the uptempo “Don’t the Grass Look Greener” with both Ramos and Welch on guitar and the feel-good, horns-accented New Orleans-style R&B of “Long Way Home”. Also worth checking out are the soft R&B duet “What About Me” from Michelle “Evil Gal” Willson and Brian Templeton; rockabilly “Hand You Your Walking Shoes” that’s sung by Dennis Brennan and gives Geraci a nice chance to show his boogie woogie side; and jazzy instrumental closer “A Minor, Affair” that again incorporates horns, with Ramos on lead guitar. 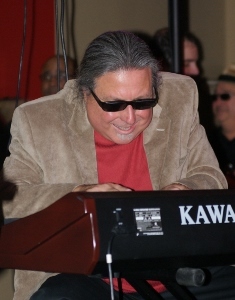 Even if Geraci doesn’t venture too far from his usual territory, it’s good to hear the blues piano man continuing to branch out on Why Did You Have to Go, not only through work with his The Proven Ones bandmates and others such as Rayford and Laws, but also in the variety of styles of playing. In the end, this is another very solid offering from Geraci that you’re going to have to go out and make sure that you own. 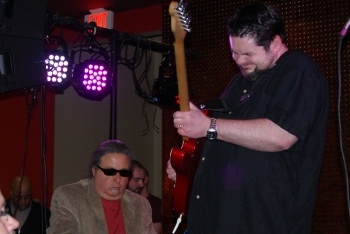 This entry was posted in Albums and tagged "Sax" Gordon Beadle, Anthony Geraci, Brian Templeton, Dennis Brennan, Doug Woolverton, Jimi Bott, Kid Ramos, Michael Mudcat Ward, Michelle Evil Gal Willson, Monster Mike Welch, Neil Gouvin, Ronnie Earl, Sugar Ray Norcia, Sugaray Rayford, Willie Campbell, Willie Laws. Bookmark the permalink.